This is part two in a three-part series on learning to code. If you missed part one, I suggest you start there. That being said, this post is a bit of a bear. It’s not difficult so much as tedious. Computers are also really picky. They’re even worse than that journal editor you had back in law school. One letter out of place and things stop working. Consider yourself warned. If you aren’t interested in coding along at home, you can still get something out of this. However, I suggest you read only through Final Thoughts. After that, it’s overkill. If you’re all for the coding, I recommend reading this in two sittings, stopping at the end of Final Thoughts and giving yourself a break before starting the homework. So if the length is freaking you out, don’t worry. There’s an intermission. Also, you can always hit me up for help in the comments or on Twitter @Colarusso. Here’s what we want our system to do: Take input from an online form (e.g., names) and pre-populate a document with this information (e.g., a cover sheet for your TPS report). I’ve chosen this as our first exercise for a number of reasons, among them: (1) it’s a stepping stone to the wicked cool project I have planned for next time; (2) it’s relevant to most lawyers’ practice; (3) it’s something people have repeatedly asked me to help them build (mostly in the form of online intake); and (4) most of it can be done in Word. Wait, what? Word? Microsoft Word? Google Forms is a free service from Google that allows you to make simple online forms. 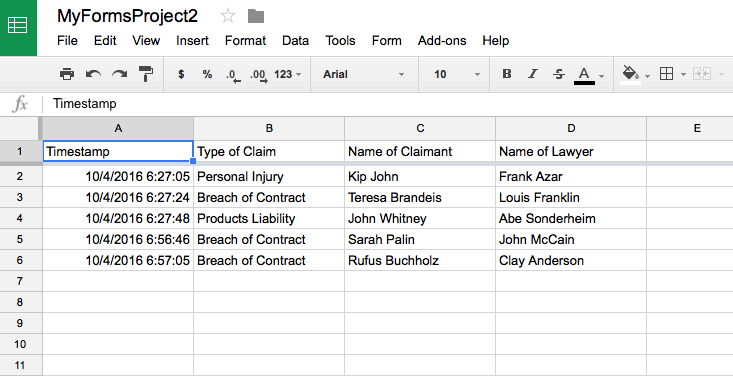 It takes users’ submissions and dumps them into a Google Sheet, Google’s online version of a spread sheet. Word can do a mail merge on an Excel spreadsheet, so there must be a way to make it work with Google. Of course, you could manually download the Form’s Google Sheet as either a Microsoft Excel (.xlsx) or a .csv file. Both formats are easy for Word to work with once on the same machine as your copy of Word. Such a setup would, however, require you to login to Google and download the file after every online form submission. You could save some time by making your spreadsheet public and sharing it as an .xlsx or .csv file, what Google calls Publish to the web…, and then you could download the file directly without the need for a login. However, this would mean you couldn’t include confidential information as the content would be visible to anyone with the Sheet’s URL. Ideally, we should be able to securely and automatically export the Sheet’s contents without a person having to click a bunch of menu items. If only there were a way for programs to talk to each other directly. Well, as you may have guessed, there is, and unsurprisingly, it has an acronym: API. An application programming interface (API) is an interface that lets programs talk to each other. Instead of a user interface where a person is expected to click menu items to get certain results, an API lays out ways in which a computer program can get those same results by specially formatting its requests. Luckily, Google Sheets has an API we can use to download the contents of our Sheet. Download this .json file and this .docx file into your project folder.7 Customarily, this is done by right clicking on the link and choosing Save Link As or similar. For mice without a right button, one can often replicate a right click by holding down the control key while clicking. Where the files are saved will depend on your browser’s settings. So you may have to move them to your project folder after saving them. The .json file contains a cryptographic key (like a password) that tells Google that you are who you say you are, in this case, someone with authorization to access a given Google Sheet. The .docx file is a template for a TPS report coversheet, complete with variables ready and waiting for the all important find and replace of document automation. There is no need to reinvent the wheel, and thanks to open source computer program libraries, there is no need to do so. I could write a whole post on the values of open source, but the creation of industry-standard no-cost tools is one of the big ones. We need to write a program that talks to Google’s API, but we can’t be the first people that have needed to do that. Programmers try to avoid duplicate work, something known as DRY (don’t repeat yourself). Consequently, they often write little programs within programs to handle common tasks. Thanks to the open source mindset, these little programs are often bundled into collections called libraries. If you have a need for something and you’re not the first, chances are someone’s written a library. In this case, we need Python (our chosen language, which you installed in part one of this series) to talk to Google’s API, and it turns out there are actually a few libraries for that.9 We’ll be using gspread. Libraries often have dependencies—other libraries they need to work. So we’re actually going to install a few libraries. Luckily, the process is pretty straightforward. Open your terminal (Mac) or command prompt (Windows). If you don’t know how to open terminal/command prompt, here are some instructions for Mac and some for Windows. Once you get your blinking cursor back, type pip install --upgrade oauth2client into the command line and hit the enter/return key. This should update a library as you likely already have oauth2client installed. If, however, you get an error message saying that it could not find a version that satisfies the requirements or some such, try removing --upgrade and typing pip install oauth2client instead. Once you get your blinking cursor back, type pip install PyOpenSSL and hit the enter/return key. Again, this should download a library and you may be asked to say “yes” a few times. Once you get your blinking cursor back, type jupyter notebook and hit the enter/return key. This will open Project Jupyter in your default web browser. Inside Jupyter (the browser window that just opened), navigate to the project folder you created above and create a new Notebook just like you did in the last project. Rename the project [your cool project] by clicking on “Untitled” and interacting with the screen that results. Cut and paste the code below into the empty cell. Here’s the gist of what it does: import some libraries (sometimes called modules); connect to Google; prove you are an authorized user; download the contents of our sheet; and write these contents to a .csv file. If you’re using Windows: replace “output.csv” with “[your projects’s location]/output.csv”. for example “C:/Users/dcolarusso/my cool project/output.csv”, and be sure to use slashes, not backslashes. Hit the run code button, the one that looks like the next track button on a CD player (right arrow with bar). You should also see a new file in your project directory called output.csv. This file should contain the same information as that above (plus any new submissions). Congratulations! You have written your second Python program.12 Not only that, you have made your first call to an API. Sure, there were a lot of steps, but they weren’t hard, just tedious, and that’s the point. You can see far when standing on the shoulders of giants. The rapid pace of technological innovation is predicated on the accumulation and sharing of knowledge. It’s not magic, and you don’t have to start from scratch. Save your Notebook by clicking the Save button, the one that looks like a disk. This will allow you to take a break and come back to your work later. To automate the running of our program, we’ll need to save it as a Python script. To do this, click File > Download as > Python (.py) and save the file to your project folder. We’ll come back to this in a while. Open TPS_Report_Cover_Sheet.docx (one of the files you downloaded above). We’re going to attach your .csv as the data source for use by mail merge. You’ll notice that our cover sheet has placeholders in several places and that they have a special format (e.g. «Project_Name»). These placeholders are what we’ll be replacing with data from our .csv file. Your version of Word may have a slightly different layout. So if the steps here don’t seem to match what you’re seeing, go ahead and Google something like “how to mail merge in Word [your version of Word] [your operating system].” You should be able to find a tutorial. Who knows, maybe even a video tutorial. Also, this might help. Source: “Tech Support Cheat Sheet” from xkcd. Navigate to the Mailings tab. Click on Select Recipients > Use an Existing List…. When prompted, find and select your newly created output.csv file. Based on your version of Word, you’ll see some type of intermediate screen asking you about the file’s formatting. Most of the time, Word is clever enough to figure things out, but sometimes you need to answer a few questions. Important things you may be asked about: (1) the first row contains column names; and (2) the data is delimited (separated) by commas. When in doubt, go with the defaults. If you’ve successfully added your data source, the Filter Recipients and Insert Merge Fields buttons should be un-grayed out. Additionally, you should see your heading names in a list if you click on the Insert Merge Field button. Save your file. This should make it so you won’t have to add your data source the next time around. So that’s one thing out of the way. What follows are the steps you will use in the future when you want to create a new document from your template (i.e., TPS_Report_Cover_Sheet.docx). Here I’m going to recommend different steps depending on your version of Word. If you’re using Windows: Click on Edit Recipient List. This will open a dialogue window that looks a little like a spread sheet. Check the box next to the recipient(s) you’d like to see in your final document. If you have a large list, you can even sort and filter your recipients to help you find the ones you want. The key is that you click the checkbox next to the recipient for which you are creating the custom document then hit OK. If you’re using a Mac: Unfortunately, the latest version of Word for Mac doesn’t present the recipient list in the same manner as Windows. I say unfortunately, because it doesn’t give you a nice tabular list like the Windows version. So I find it easiest to turn on Preview Results and and step through the entries until you find the one you want. First click on Preview Results. You’ll notice that the placeholder text is replaced with data from your .csv file. For example, «Project_Name» became Penny Pincher. Use the arrow keys to the right of Preview Results to step through the items in your data source. You’ll see the number change along with the contents of your template. Here, I’ve settled on Samir’s entry, entry number 3. Select Current Record from the pull-down adjacent to the Finish & Merge button. Both Windows and Mac: Click the Finish & Merge button. Choose Edit Individual Documents… from the dropdown menu. If you’re using Windows, you’ll be asked which records (entries) you’d like to use. Choose Current Record and click OK.
Word should open a new window with a name along the lines of “Documents1” or “Form Letters1.” This is your final output. Save it. Print it. Have fun! To make another document, all you have to do is open your template file, choose your recipient(s), and run the mail merge. To actually save us time, our Python code needs to run automatically. Enter scripts. 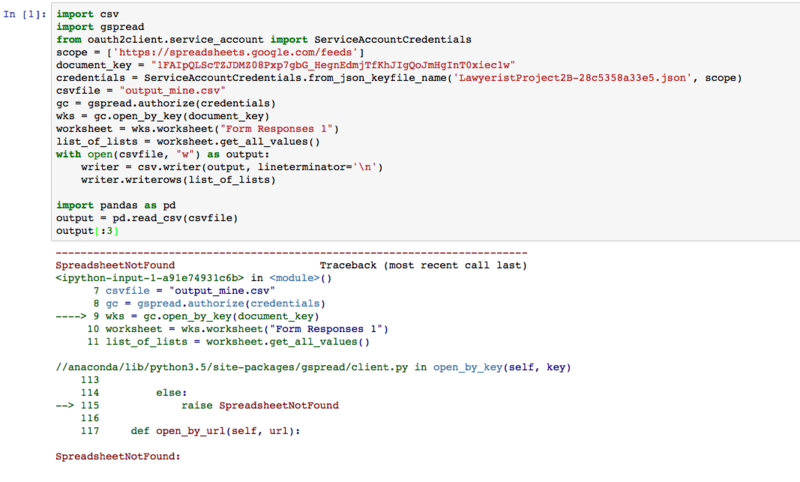 Above we saved our code to [my cool project].py, something we call a Python script. Scripts like this can be automated to run at set intervals by using a task scheduler, and this is how we’ll assure that the .csv on your computer is in sync with the Form’s submissions. Here again, your operating system will dictate next steps. However, in both cases you will need to use the command line. So open up terminal or the command prompt as appropriate. FYI, you may be asked for your password. If everything worked, you should receive a message saying that your task was successfully scheduled, and every five minutes a new output_mine.csv file should be written to your hard drive. You’ll be asked if you want to replace the existing PythonSheets task. Type, “y” and hit enter, and you should be good to go. If you’re using a Mac: Type and run the following command into the terminal. Hit the esc key to escape insert mode, and then while holding down the shift key hit z twice. This will save you edits. Now enter and run the following five commands one after the other. The task scheduler we used is called crontab, and you can find a deeper discussion of how it’s used here, including how to change the frequency of calls to your script.13 If you need to turn off these calls, repeat the insert text steps above, but delete the line referencing your script. Windows or Mac: It’s worth noting that you could go a step further and fully automate the mail merge by making a new document every time a row was added to your .csv file, but that’s a bit beyond the scope of this post. It should, however, be clear how this is just the natural extension of the above. Remember, this was paint-by-numbers. Hopefully, you have a pretty picture and a sense of accomplishment. In a single sitting you were able to build a very simple document automation system. Yes, functionally all you did was automate the saving of a file from Sheets to your hard drive, but that’s not really what this was about. Sure, it’s a Frankenstein’s monster of existing tools stitched together by a few lines of Python that for you are nothing more than an unintelligible incantation, but IT’S ALIVE! It gives you a better feel for what animates it than you would if I had tried to explain the concepts of open source libraries and APIs in isolation. Next time, we’ll build on what we’ve done here to construct Twitter bots. That should be fun. What’s that you say? You didn’t learn anything? One of the hardest parts about learning a new subject is knowing where to start. I used to run a science themed video explainer series. People would email me science questions, and most of the time I found the thing standing between people and the answer to their questions was nomenclature. They didn’t know what magic words to type in Google. The majority of my replies to them were links to Wikipedia—links they could have found if they had known something’s name. Here, you learned some new names, and they are the names you need to keep moving forward.14 Next time, after we build our bots, I’ll share a list of resources to help channel your interests whatever your inclination: Disruptor, Pragmatist, or Liberal Arts Major. Before starting your homework, I suggest letting things sit for a while. What follows is a tad tedious, and you’re more likely to finish if you’re working on a project you find compelling.15 Think of a document or documents you really want to automate. Once you have something that excites you, that’s when you should continue.16 Make sure you have all of your inputs listed and a good idea of what your final document will look like. Above, you were able to access the Google API by using my key, but this isn’t sustainable since I’ve literally made the key available to anyone with an internet connection. After all, the reason to use the key is to protect your data. So you’ll need to get your own and keep it secret. Here’s how. If you don’t already have one, create a Google Account. Sign into your Google Account and visit the Google Developer’s Console. You should see a screen like that below. Note: I’ll be using screen shots I took when making the key I shared above. Click on Credentials in the menu on the left. You’ll probably have to wait for a while as the project is created. After that, you should see a prompt asking you to create credentials. Click on Create credentials and choose Service account key. If you get bounced back to the home screen, click on Credentials again to see these options. You should see a screen like this. Choose New service account from the Service account dropdown. Give your account a name under Service account name. I called mine read-my-sheet. Copy down the Service account ID (i.e., read-my-sheet@sheetsbot-141902.iam.gserviceaccount.com). You’ll need this later on. Select a role for your key. I choose Project > Viewer because I was sharing it with the world. You could give yours more authority if you like. Make sure that JSON is selected as your Key typeand click Create. This should result in your browser prompting you to save a .json file. Save this file to your project folder. After this, you should see the following notice. Of course your file name will be different. Above we made use of a simple form I put together, but I’m sure that you’re going to want to collect a different set of data. Which means creating your own form. Here’s how. Now we’re going to create your own Google Form. Somewhat counterintuitively, we’ll start by making a Google Sheet. Go to the Google Sheets page. Create a new sheet by hitting the box with the big plus symbol. Click Tools > Create a form. Open a new browser tab and visit your sheet. Copy the sheet’s ID (i.e., the long string of text between slashes and right before “/edit”) to your clipboard. You’ll need it soon. This should open a new tab with a blank Form. You should be prompted to take a tour. I recommend you take the tour. If you don’t see this prompt, you can click the question mark at the bottom right of the page and choose Take a tour. After the tour, go ahead and create your form. After you’ve created your form, click the Send button. This will open a window with several sharing options. Choose the link option and copy the URL. This URL is where users will access the form. Fill in some sample values and click SUBMIT as a test. Go back to the tab with your Sheet. You should see your test submission. If you look at the bottom of the window, these submissions won’t be in Sheet1. Rather, they will be in Form Responses 1 or some such. Take note if the name is different, and click over to the new sheet if you’re still in Sheet1 and don’t see the results. Click the Share button in the upper right-hand corner of the window. Add the Service account ID from the steps above and click OK. You can set different permission. I unchecked Notify people because my API access isn’t a person. This, however, prompted Google to double check. I clicked OK. Note: Word can be very particular about the names of mail merge fields. Most of the time it will automatically convert column names into an acceptable format (e.g., replacing spaces with under scores), but sometimes not so much. These names are taken from the names of your questions in Forms. So avoid using special characters and the like. With the creation of your own Sheet and the fact that this sheet can only be accessed with your key, it would seem that we need to update your code (the place where we really do our work). I’m assuming that I don’t have to spell out the step-by-steps for things we’ve done before. However, you will have to you still have to tweak your code. Here’s how. In Jupyter, open the Notebook you saved earlier. Replace the old ID (i.e., 1FAIpQLSepHbg9slmVc4elsLhtlrbGtEKlYq-XBulNm1aKFAjBLNVULw) with your new form’s ID (remember you got this from the form’s URL). Replace the old.json file (i.e., SheetsBot-32718db5596a.json) with the name of your new .json file. Replace output.csv with a new name like output_mine.csv. However, if you’re using Windows, include the path to your project. For example “C:/Users/dcolarusso/my cool project/output_mine.csv”, and be sure to use slashes, not backslashes. If your results were in a sheet with a name other than Form Responses 1, replace Form Responses 1 with the proper name. For reference, here’s the unedited code. Run your updated code as you have before. You should see the data from your test submission, and a new .csv file should be created in your project folder. Save your Notebook as a Python script as you did above. Schedule the script to run at regular intervals as you did above. Above, we made use of a barebones cover sheet, but I’m sure you’d like to automate something more complex. So you’ll need to make your own template. Here’s how. Open a blank Word file and using the same steps as above, add your new .csv file as the data source. This should un-gray the Insert Merge Field button under the Mailings tab, allowing you to place variables into your document. Again, your version of Word may differ in layout. So Google as needed. Generally speaking, you should create the template document you want, place the cursor where variables should go, and select the appropriate variables from the Insert Merge Field dropdown. This will cause the variable’s placeholder to appear (e.g., «Project_Name») in the document ready for that good old find and replace. Save your template file, and do mail merges on your data as you like. + F9, not control + F9 to create field braces. If you’d like something a little more visual, however, you can play around with the rules feature by clicking on the Rules button. See? Your system doesn’t have to stay simple. Featured image: “Paint by Numbers Mural” by Paul Sableman is licensed CC. The image has not been modified. Last updated March 28th, 2019. Thanks for taking the time to post this. You made something very intimidating a little less intimidating. Hello, Mr. Colarusso – I’m the fellow with whom you exchanged tweets several days ago about my problems getting your example code for this project to run in terminal mode and to get my own code, based on the homework assignment, to run. I posted some screen shots showing the problems. As mentioned, I run a MacBook Pro with OS X 10.11.16; I believe it was pre-installed with Python 2.7. I uploaded Python 3.5, in connection wth taking a free Coursera course sponsored by Microsoft. I posted a screen shot showing where it resided on my computer. One error I get relates to the inability to find gspread, even though I see that it is successfully installed. I uploaded some screen shots showing both. I got separate errors when I uploaded my code for the homework and ran it in a Jupiter Notebook. Not sure whether I posted a screen shot of this on twitter, but here that is. Let me know if you need me to uploaded some of the screenshots here and whether you would like other information to continue our conversation. Thanks again for taking a look at this. Given that you have multiple versions of Python installed, the first thing that comes to mind is making sure that gspread was installed for the version of Python that you’re running in Jupyter. From the error message you posted, however, I’m guessing this isn’t the issue because you aren’t getting an error about not having gspread, but rather an error about not being able to access your spreadsheet. My guess, however, is that you’ve got the wrong ID for the sheet, which isn’t surprising as there’s currently a typo in the above, asking that you pull the ID from your Form’s URL. You should, however, be pulling it from the Sheet’s URL. Hopefully, this will be fixed soon. Also, be sure that you shared your sheet with your project via its email (e.g., read-my-sheet@sheetsbot-141902.iam.gserviceaccount.com). That being said, let me know how it goes. Thanks for your suggestions. I enjoyed partial success. First, inside a jupyter notebook, I checked for all modules. I got some sort of “ShimWarning” as part of a torrent of output, but at the end I saw a host of modules printed out that included gspread. I then undertook a new homework project, first creating a spreadsheet and linked forms in Google docs. I then made several entries to the form and saw that those entries were recorded in the linked google sheet. Modifying your code, I was able to run the code for my project in a Jupyter Notebook and could pull up and see, in the output, the entries that I had just made. That was the initial success. I then added several more entries to the form and, when I manually opened up the Sheet in Google Docs, I saw those additional entries recorded as well. However, when I then re-ran the python code in the Jupyter notebook, I got the same previous output. I tried this several times but the output would not update when I ran the code. I am uploading with this post the following screenshots so that you can see what I was able to do and not do: 1. a screenshot showing the successful run in Jupyter (but run after the update on Google Sheets); 2. a screen shot of the updated Google Sheets; 3. a screenshot showing the code in text wrangler; and 5. a screenshot showing the output once run out of text wrangler. Anyway, thanks for your continued look at this. I would like to get to your next installment but wanted to make sure I worked out as many bugs as possible first. https://uploads.disquscdn.com/images/12c5e91b0d7127b200b2bdcd60b48e59f2fab9b6530893f2983abbaa4b8033b1.png https://uploads.disquscdn.com/images/2117c7b195bc58b45863cb43349660e554b58eaccd2a29fa12ac07fbcf772ff4.png https://uploads.disquscdn.com/images/30a9b716cac8480b538713df197ee0916d5a55a71087d32e8fbd0cf21d941916.png https://uploads.disquscdn.com/images/23a3785ba812d22dd34e4ec7d8c7178b920bf512db08e34c7d8993bb28340b7a.png https://uploads.disquscdn.com/images/59469f24b0d8bf0a9adc9e57cfe6e09337f5fd7b47f710c42037f8c96d18b6b2.png .ould like to get to your next installment but wanted to make sure I worked out as many bugs as possible first. Sorry, this sat here for so long. If you’re seeing the updates to your sheet in the output, then it would seem that everything is working. Are you saying that this is intermittent? Are there steps you can take to make it break or make it work? If it responds in two different ways, something must be changing. The trick is figuring out what. Also, the Python Root option is just fine. Please let me know where things stand, and good luck. Thanks for your reply. My previous post was likely less than clear. Unfortunately, although the Python script generated an output that showed the Google Sheets rows that I initially inputted, when I added more rows to the spreadsheet, and then re-ran the script, I still got the old version of Sheets. Nothing updated. That is the first problem. The second remains my inability to make anything work outside of the Jupyter notebook environment. Looking forward to working out these remaining bugs so that I can tackle the assignment in your final blog post. I’m getting an API error when running the first bit of code on this page (that creates the output.csv file) that says, “Google Sheets API has not been used in project 368282458943 before or it is disabled. Enable it by visiting https://console.developers.google.com/ apis/api/sheets.googleapis.com/overview?project=368282458943 then retry. . . ” I tried following the link, but got the message “The API “sheets.googleapis.com” doesn’t exist or you don’t have permission to access it.” Is the API gone or am I doing something incorrect? Thanks!